New intelligent transportation systems have recently landed on B.C. highways. While these might sound like extra-terrestrial time-travelling devices, they are actually human-created combinations of advanced and emerging technologies like computers, electronic sensors and communication devices. We’re using them in the ministry to save lives, time, money and energy, and protect the environment. What makes these systems so smart is that they can automatically warn motorists, about conditions in areas that might require extra care to drive. The most recent one was installed by the ministry on Highway 1, between Glacier National Park and Golden, where the curved bridge over Quartz Creek is prone to icing up. For eastbound drivers who travelled straight down a hill to approach the curved bridge, an unanticipated icy surface could be an especially startling surprise. Sensors, solar panels and other technology work in sync to monitor conditions on Quartz Creek bridge and send warning messages to nearby signs. But now, the intelligent system warns drivers who approach from either direction, when slippery conditions exist on the bridge deck, with signs that flash “Bridge Slippery, Slow Down”. How do the signs know to do this? Sensors in the asphalt measure the pavement surface temperature, freeze point data and note whether the road is wet, dry, snowy or icy. Equipment mounted on a weather station near the bridge measures air temperature, humidity and precipitation, and includes optical pavement sensors which use spectral analysis to detect the presence of water, snow or ice on the bridge deck. Information from the road sensors and weather station is then processed by the station’s data logger to determine whether slippery conditions exist. If it’s determined that the bridge is slick, the data logger uses wireless communications to activate the illuminated signs and alert drivers to the concern. Information is analyzed every 15 minutes, to detect potentially hazardous conditions on the bridge. Not only is this system smart – it’s energy smart. All components are powered by arrays of solar panels, since there is no electrical source available in the area. Since safety is our guiding principle, the ministry’s specialists in traffic, safety and electrical engineering, and its weather network program, along with Westcana Electrical from Nelson, came together to devise the savvy system. The technology at Quartz Creek was based on a pioneering project by the ministry at Kennedy Lake, on Highway 4, which drew North America-wide attention in transportation circles, last spring. Here, a road weather station and two overhead changeable message signs are linked in a clever way to keep motorists aware. 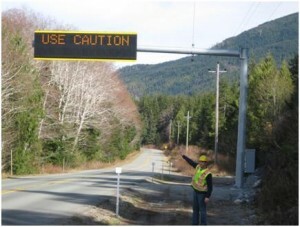 The signs are located about 10 kilometres apart on the stretch between Port Alberni and Ucluelet – a narrow, winding corridor subject to frequent heavy precipitation, dense fog, heavy snowfall and icy road conditions. 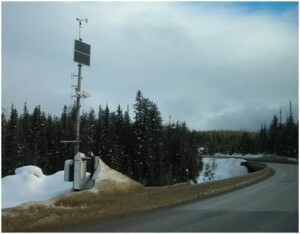 A highly visible sign at Kennedy Lake, on Highway 4, receives alerts from the weather station there. A weather station there collects and measures data using electronic sensors that that gauge air temperature, humidity, wind speed and direction, precipitation, snow depth, pavement temperatures and pavement condition. Once the information is gathered, the station’s data logger analyzes it, and uses wireless communication to update the messages on the signs. For example, if there is a significant amount of precipitation, the station will detect this, determine the appropriate message, and post “Water Ponding Next 10 Km Use Caution” onto each sign. This innovative intelligent transportation system was built through a funding partnership between the Ministry of Transportation and Infrastructure and ICBC, and involved ministry staff, Raylec Power Ltd. and Emcon Services. Rapidly changing road conditions are an ongoing challenge to highway safety. But we’re boldly testing and using new technologies to alert motorists to hazards ahead.